Archeologists working on the latest dig at the site of the Terracotta Warriors in Xi'an say the project has already turned up vital historical finds. Experts restarted work on the No 1 pit of the Terracotta Warriors in 2009 and have so far unearthed 310 artifacts, including parts of chariots, weapons and tools, along with 12 pottery horses in three groups, and about 120 more warriors. "For the first time, we have found a painted, cortex shield on a chariot, which is the first of itskind to be discovered in any of the three pits," said Cao Wei, curator of the Museum of the Terracotta Warriors and Horses of Qin Shi Huang. Shields used by soldiers in the Qin Dynasty (221-206 BC) were 60 cm long and 40 cm wide, with red, green and white geometric patterns. "The shield was partly broken, and it's believed it was the type used by a high-ranking official, as it's larger and had colorful patterns," said Zhang Weixing, a researcher on the archaeology team. "The brightness of the painting exceeded our expectations," he said, adding that it was a surprise to unearth such a number of painted figures as many archaeologists considered before the excavation that the paintings on the figures would be damaged because the pit hadbeen damaged in a number of ways. This is the third dig to take place in the museum's No 1 pit in Xi'an, capital of Northwest China's Shaanxi province. Yuan Zhongyi, the former curator who presided over the No 1 pit's first excavation, said one ofthe important achievements of this dig is the arrangement of the Qin army. "Archaeologists speculated in the past that the ancient army should have a wing guard to prevent enemy attacks from the side, and this excavation confirmed that the Qin army really had wing guards," Yuan said. 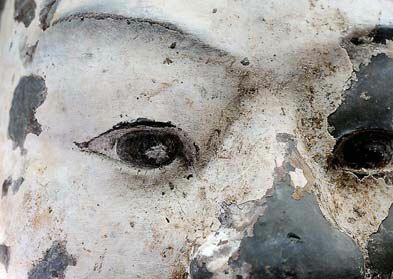 According to Xu Weihong, the researcher in charge of the excavation from 2009 to last year, archaeologists found a number of warriors with black or gray-brown eyes, and even a figure with red eyeballs and black pupils. 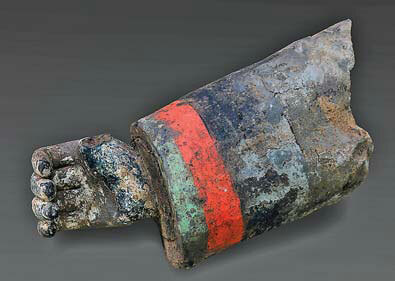 "We also found a figure that was believed to have had a high rank as he had well-made and colorful armor," Xu said. For a long time, there were two views about the burning of the warriors and horses: One was that it was spontaneous combustion that was caused by biogas produced by wood and other organic materials inside the pit; and the other was that it was a deliberate act. During this third excavation, archaeologists found evidence confirming that the fire was deliberate. 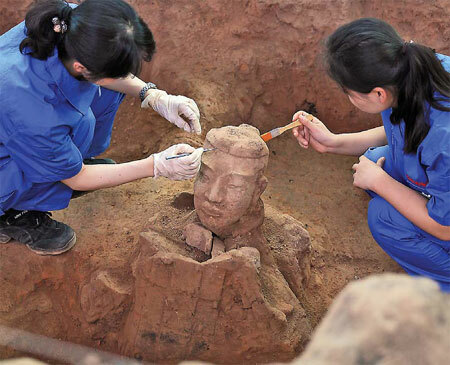 "Now, many archaeologists think that Xiang Yu (232-202 BC), one of the leaders to overthrow the Qin Dynasty, and his soldiers may have set the fire to the pit, " said Shen Maosheng, head of the archaeological team for the third excavation. "This finding is one of the major achievements of the third excavation." According to the team leader, archaeologists also found a pit with performers. 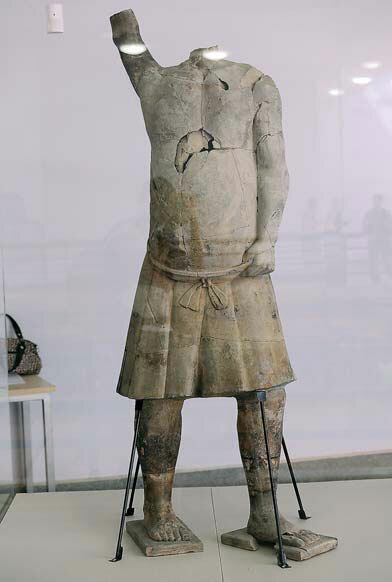 "From the pit located in the southeast part of the mausoleum of Qin Shi Huang, the first emperor of the Qin Dynasty, we unearthed 41 figures that were very different from the military figures. From their gestures, we can see that they were performing," Shen said. "Among the performers, we found one that was 2.5-meters tall, and all of the figures had red, purple or black and red patterns," Shen said. According to curator Cao Wei, the third excavation will be completed within two or three years. "The third excavation stated on June 13, 2009, and the public can see the archaeologists at work in the pit," said Cao, who added that more than 1.4 million people have witnessed the excavation work at close quarters over the past three years.